Boston Nordic Group has its head office and logistics centre in Farum just outside Copenhagen and subsidiaries in Kungsbacka, Sweden and Arendal, Norway. Boston was established in 1996 and the Swedish and Norwegian offices in 1999 and 2003 respectively. Boston is a proactive marketing and logistics channel between international manufacturers and Scandinavian retailers. The product niche is and always has been computer accessories and consumer electronics with a strong brand image. Focus, industry knowledge and long-term thinking makes Boston a value- increasing and attractive cooperation partner. The AAA rated group has an overall turnover of just over € 62 million. They have more than 50 employees throughout Denmark, Sweden and Norway. Today Boston has more then 40 employees and services over 3000 distributors in all of Scandinavia. Some of the products Boston distributes comes from Creative, Canon, Logitech, Microsoft and many more. 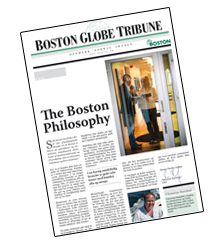 Click the picture to read "Boston Global Tribune", which gives a good description of Boston's business and philosophy.